So what does the experts think about the current status with the Singaporeproperty prices and when is the right time for our government to consider winding back some of the existing cooling measures? The market has seen a slow but sure decrease in pricing since 4Q'2013. While prices were expected to fall between 5 - 8% at the beginning of 2014, we will probably see prices falling 8 - 10% for the rest of the year. Barring any external shocks that may accelerate price decline, prices may fall 10 to 15% by the end of 2015. Unlike previous times, Singapore currently still enjoy positive economic growth, very strong employment and very high liquidity. Given such, strong buying interests still remain as long as prices from developer is "right". So those 30% (global financial crisis) or 60% (Asian financial crisis) drop are unlikely to happen this time around. Even if a rude shock were to happen, we can expect policy response to be much faster this time around. So any downturn or recession will be better cushioned and compressed. Fundamentally, our banks are also much stronger and amongst the most liquid in the world. Buyers are also more liquid and just waiting for the right opportunity to enter the market. Developers are also equally liquid these days. So we hardly see any distressed sales, both by home owners and developers, unlike during the global financial crisis. A 20% drop in home prices is probably the psychological threshold that policymaker will come in to ease off on cooling measures. If you purchase a property 3 to 4 years ago, your LTV (loan-to value) is about 80%. So banks will start asking for top-ups if home values drop 20%. As it stands, only a sharp drop in property prices within a short period, or a groundswell of unhappiness from a large number of home owners, could prompt the government to act faster to relax on cooling measures. Home buyers are advised to wait before taking the plunge as prices are likely to get more competitive. So we have heard from the experts. The magical number is still 20. 1) Although the Singaporeeconomy remains somewhat positive, subtle signs of a slow-down are beginning to show - GDP is shrinking, economic growth rate forecasts are being cut and new job creation rate has hit new lows. 2) There have been increasing "sound bites" from banks about NPL (non-performing loans) on the home mortgage front. Despite the number being still low and "manageable" by the banks' standards, this is certainly a cause for at least some concerns. 3) In addition, interest rates are moving up slowly but surely. This will put further pressure on existing home owners with significant amount of mortgages. 4) The current geopolitical situation around the world are not giving us much comfort either. Any of the "hotspots" may explode overnight and causes dire effects to global financial markets. While Singapore may be more resilient to deal with a financial crisis as compared to 1997 or 2007, there is probably little we can do to mitigate the damage if the rest of the financial world goes into a tail-spin. 5) If our memories served us right, things started unravelling fairly quickly during 1999 and 2007. The property markets were down in a matter of weeks and at astonishing pace. All the buyers simply disappeared! So any counter-actions to try and prop/revive the market at that point in time were more or less futile. 6) While a price drop of 20% in property prices tomorrow may benefit certain groups of people (the "cash rich" and "risk taker" as per our previous post), it may led to rather serious repercussions and even negative equity for some. Despite all the talks about high level of liquidity out there, the wife and I believe (rightly or wrongly) that this only resides in the hands of a small group of potential buyers. There are many people out there that are seeking to "upgrade" and are primarily dependent on the money that they are able to generate from selling their existing homes to do so. So a sudden and severe price drop may not necessarily benefit this group of buyers. 7) So what is the "right" time to enter the property market or "upgrade"? Our mantra has always been that one can almost never catch the highest (for sellers) or lowest (for buyers) price point. At least we have never managed to do over the past 5 or 6 properties that we have bought and sold. Our "right" time is a combination of "gut feel", comfort level (especially if we are going to stay in it) and more importantly, affordability (are we stretching ourselves too thin in terms of the cash component and can we reasonably afford the mortgage payment over the course of the next 5 years?). And as long as you possess the "holding power" and given that the property market comes and goes in cycles, you wouldn't go too wrong even if you enter the market now. This approach has served us rather well thus far (*fingers crossed*). 8) So where do we see the market in 6 months' time? We have often been off the mark when comes to this question. But sticking our necks out (again), the wife and I reckon that private property prices will probably fall by some 10% by the end of the year. This is assuming that everything (government policies, global and local economic/political situation etc.) remains status quo. 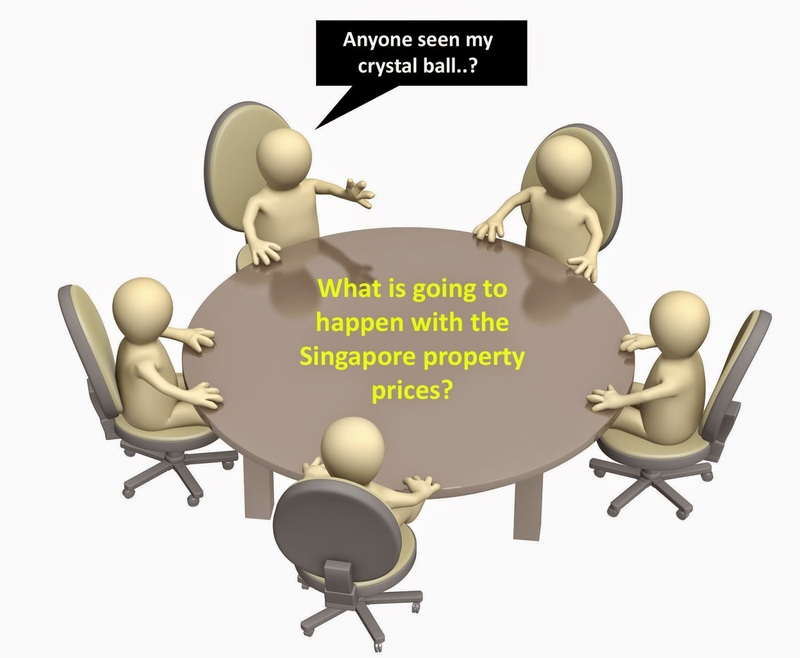 2 comments to ''What gives, Singapore property prices? " RESALE prices of non-landed private homes slid further last month to their lowest point in 18 months and will probably keep falling, consultants said yesterday.